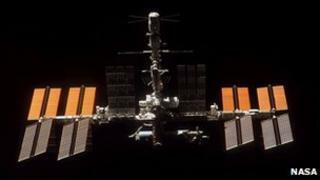 Europe has formally agreed to the extension of operations at the International Space Station until 2020. Member states have also put in place the financing to cover their commitments at the platform for the next two years. The decisions were taken at a two-day council meeting of the European Space Agency at its headquarters in Paris. Europe is an 8% partner in the ISS project with the US, Russia, Japan and Canada. Esa's space station manager, Bernardo Patti, said the announcement from council was a significant development. "This is the formal acceptance from the member states that the space station will last until 2020 and will be supported financially; and that is really excellent news," he told BBC News. "Now that the ISS is built, the emphasis in the coming years will be to maximise its exploitation." All five ISS-participating space agencies had indicated last year their desire to see the platform continue flying beyond 2015, but Europe had until now struggled to agree the funding arrangements within its member states. The 10 Esa nations that subscribe to the station project approved a 550m-euro sum at the Paris gathering to supplement the 1.4bn-euro package passed at the Ministerial Council in The Hague, Netherlands, in 2008. This extra money will cover commitments until the next Ministerial at the end of 2012, when member states will then initiate a 2bn-euro arrangement to take European participation at the ISS through to 2020. By the end of the decade, it is expected Europe will have spent about 9bn euros over the full 25 years of the project. The 2020 date, however, is a minimum extension at the moment. Engineers believe much of the infrastructure in orbit will be serviceable well beyond that time. Most of the living and working space on the non-Russian side of the station has been fabricated in Europe and its engineers believe their modules should still be fit for purpose in 2028. The way the ISS project works means the partners provide components and services rather than hand over cash to belong to the "club". For Europe, this requires that it deliver tonnes of supplies to the station with its huge robotic freighters, the most recent of which (Johannes Kepler) has only recently docked at the platform. Three further freighters are planned which should see Esa meet its "subscription" up to 2017. A new vehicle based on the freighter would then be developed to meet commitments beyond that date, Mr Patti said. The design of this ship and its precise role would be agreed with the partners, he added. Esa is also looking to collaborate with European industry on the development of new technologies at the station in the years ahead. The first of these developments could be a new communications system. "Europe doesn't currently have its own communications connection with the station; we use the Americans'; and we pay for it," Mr Patti explained. "You can view it like a telephone bill, and if we have our own telephone installation then we would have cost avoidance on the one hand and more flexibility and autonomy on the other," the official told BBC News. With Europe's responsibilities at the station come certain rights - the most important of which is astronaut places. The extension to 2020 means two six-month residencies, in 2017 and 2019, become available. Esa is also looking to buy one additional place from the Americans. None of these three positions - and a seat already guaranteed in 2015 - has yet been allocated to specific European astronauts.